This was the easy part. I bought myself a microplane when I was Christmas shopping so grating the ginger and garlic was so easy. Thanks Rachel Ray for that tip! Next up, time to prepare the wrappers. I am not good with dough, I do not have a lot of experience with making homemade dough and I am too impatient to take my time and do it right. This time I tried to be better about all of that. I mixed up the dough and then rolled out 8 wrappers as best I could. Then I filled and sealed the dumplings and put them in the pot of already boiling water with a steamer basket. This was also a Christmas gift to myself in a round about way. I bought it as part of my Yankee Swap gift and I ended up taking my own gift home. I may or may not have planned it that way, or at least hoped it would go that way! Ohhhhhhhhhhhhhh boy. These were SO good. They didn't need all 20 minutes in the steamer but other than that, they were delicious. The dipping sauce was perfect too. Just like the Chinese restaurant! Ok, well maybe not exactly the same, but close enough for me. 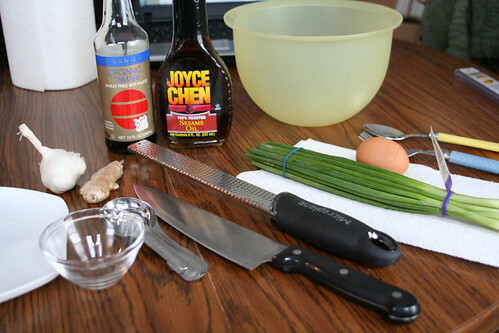 Here's the recipe! Combine the above ingredients, adding more water if needed until dough comes together. 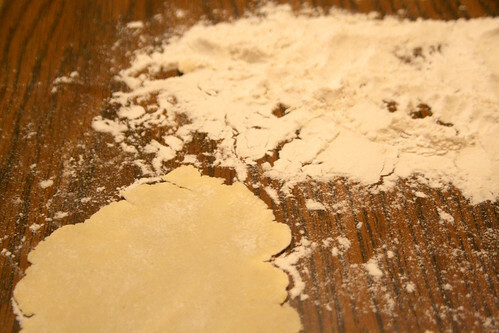 Use plenty of extra flour on your work surface and your rolling pin! I split the dough into four sections, and then each of those sections broke down by four more sections. Roll out each section to the size and shape of your liking. Layer the wrappers between damp paper towels to keep moist until you are ready to fill. Once the wrappers are ready to go, spoon a little more than a tablespoon of the filling onto the center of the wrapper. Put a little bit of water on the edge of one half of the wrapper to act as a glue to seal the wrapper shut when you fold it over. Press the edges together to seal, you can do this by hand or use a fork to gently press the edges together. 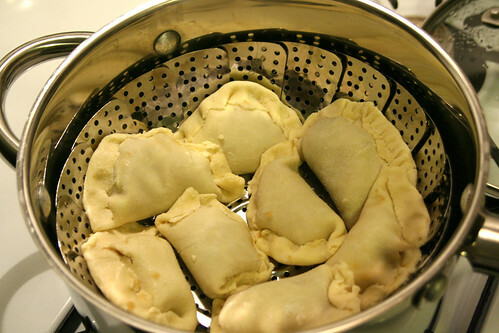 Place the finished dumplings into your steaming apparatus such as a bamboo steamer or a basket steamer as shown above, which already has the water boiling in the bottom. Cover the pan and let steam for 15-20 minutes. While the dumplings are steaming, put together your sauce. When the time is up, check to be sure the dumplings are cooked through. Then, dive in head first and enjoy!! I ended up only making half the recipe to start, plus that was all that would fit in the steamer. My plan is to prepare the rest of the dumplings and freeze them for another day. Oh Jen - these look SO fabulous! I miss pork buns as well - they were always a NEw YEar's Day family tradition growing up, and we'd all spend an afternoon in the kitchen making different kinds of dumplings, potstickers and wonton soup...I might have to give these a try this New Year's and revive the tradition. These look great! I never would have imagined you could make Chinese dumplings gluten-free. I'm bookmarking this recipe for my family. Totally drooling over these!!! You go, girl! 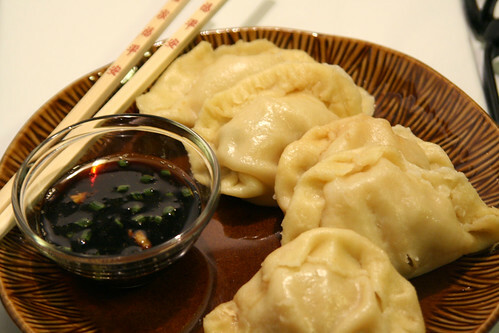 If you are missing gluten free dumplings check out our site. www.feel-good-foods.com. We offer a line of chef driven gluten free dumplings.